Prefer to subscribe to digital-only? YES! 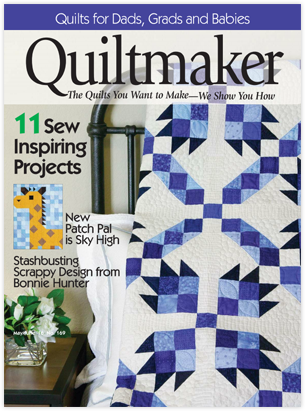 Please send my FREE Preview Issue of Quiltmaker! If I love it and choose to subscribe, I'll get five more great issues (6 in all) for just $17.97 + $2 p&h – a savings of 44% off the newsstand price! If not, I'll write "cancel" on the bill, return it and owe nothing. The FREE issue is mine to keep no matter what! *Offer valid in the U.S. only. Outside the United States click here. No purchase necessary to enter or win the PFAFF® sewing machine. A purchase does not improve your chances of winning. Please send me Quiltmaker FREE newsletter plus tips, project ideas and exclusive offers via e-mail. You'll also receive special offers from our marketing partners. PAY NOW AND GET 12 FREE BONUS GIFTS! When you pay now, you'll also receive 3 additional quilting guides including 12 all new patterns to download and use right now. That's a full year of Quiltmaker issues, the Quiltmaker Classics Volume 1 issue and and 3 more FREE quilting guides (12 patterns!) – all for just $17.97 (+$2 p&h). Choose the "Bill-me" option to receive the free issue only. SUBSCRIBERS' AUTOMATIC RENEWAL FEATURE: I understand that I will receive uninterrupted service and delivery of my magazine and that my subscription will be automatically renewed each year at the rate then in effect. I won't be bothered with any renewal notices in the mail; instead, I will receive a clearly marked annual reminder about 60 days before my credit card is charged or a bill is sent. I may cancel at any time during my subscription and receive a refund on any unmailed issues by calling 800-388-7023 (U.S.), 1-386-597-4387 (Int'l), or visiting Subscriber Services. If giving a gift, this does not apply to your subscription or your gift subscription. 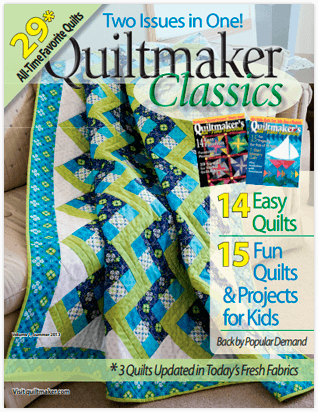 Quiltmaker magazine publishes 6 times a year. Savings based on an annual newsstand price of $35.94. © 2019 F+W, Inc. All rights reserved.